Detroit area transit planning. I have been meaning to write about the initiative in Greater Detroit, after a failed referendum in 2016, to create a multi-county transit district. The QLine streetcar on Woodward Avenue passes under the People Mover near Grand Circus Park. Photo: David Guralnick, Detroit News. Besides various bus services in the region, which includes Washtenaw County where the University of Michigan is located, to boost support for transit, Detroit has a people mover system ("Making the case for intra-city (vs. inter-city) transit planning," 2011) and a recently opened streetcar on Woodward Avenue which I have not written about at all, but is very interesting because much of the funding for it came from local foundations ("Detroit charts a public-private path to its future, with streetcars," Christian Science Monitor). I-75 in Oakland County, Michigan. 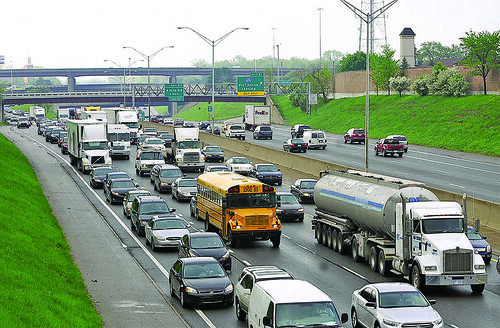 Photo: Crain's Detroit Business, "I-75 plan opens transportation rift: Business planners, mass transit backers differ on 20-year freeway widening project." Circa 2003, Oakland County Executive Patterson kicked the City of Ferndale out of the county's Main Street commercial district revitalization program because the city opposed the widening of I-75. After seeing a headline of a story ("Hackel: Let's not rush to create "obsolete" regional transit in southeast Michigan," Michigan Public Radio) quoting Macomb County Executive Mark Hackel (his brother, now a judge lived across the hall from me my sophomore year in college), I was thinking that in a situation where your transit system is mostly going to focus on bus service, what should a 21st century bus system look like? In short, Mr. Hackel was making a reasonable point. Instead, Hackel favors letting the auto industry and its new technology, especially autonomous vehicle developments, lead the way. What should a 21st century bus-based transit system look like? But bus rapid transit lines and system service redesigns aren't always game changers. Concerning the design of a design forward bus-based system, I think it's fair to say despite what people argue, bus (rapid transit) vehicles "designed to look like trains" and high quality bus shelters are no longer enough to reposition bus service as a premium service in a mobility paradigm that preferences automobility ("Improving bus service overall vs. reversing falling Metrobus ridership," 2018), especially in a region like Detroit, which is the most automobilized of any US metropolitan area other than California and Texas. Perhaps the way to think about it is that BRT programs and schedule and footprint reconfigurations only accomplish so much in terms of adding riders. 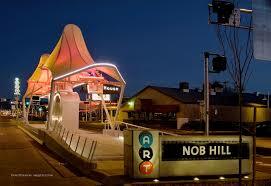 According to the designers, Studio Hill Design Ltd., the bus livery and typefaces chosen for the ART -- Albuquerque Rapid Transit -- bus line reference 1950s styles in an aim to reference the design of buildings along Route 66. 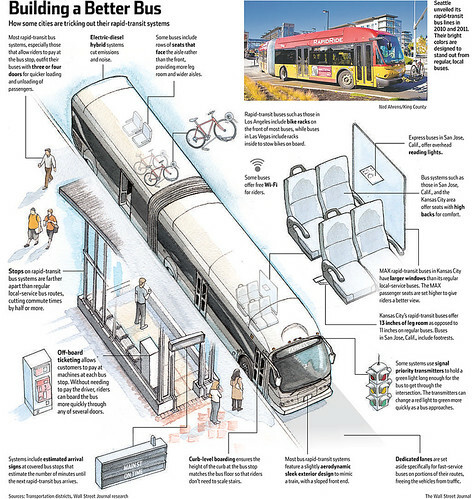 ... even though BRT systems in Albuquerque (ART), Cleveland (HealthLine), Connecticut, and Mississauga (Mi-Way) are a quantum leap forward in design and operation compared to the legacy bus systems that serve most communities. -- "Takoma Langley Crossroads Transit Center: a critical evaluation," 2016. Atlanta. A similar conversation has been occurring in Metropolitan Atlanta for all of the decade. After a failed transportation referendum in 2012 ("Failure of the transit-roads sales tax measure in Metro Atlanta"), the region continues to grapple with the need for transit/congestion management and how to go about accomplishing it, with the same kinds of animus and fear in the Detroit area about race and the center city vis a vis the suburbs. 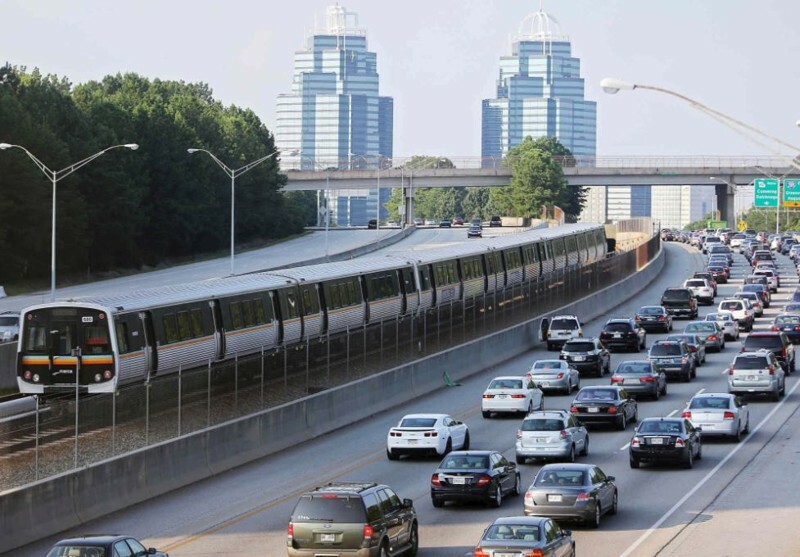 Atlanta though has heavy rail through the MARTA system, but its potential has always been crippled by the fact that Cobb and Gwinnett Counties opted out of the system from the very beginning. 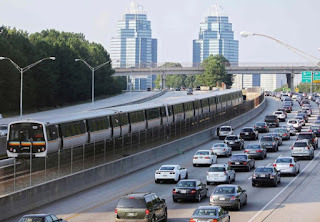 More recently, the transit system has been successful at engaging these counties, although Keith Parker, the general manager who pulled off this wizardry, last year left the system for another job ("Keith Parker puts us back on track," Atlanta Magazine; "MARTA GM: 'Build, connect, innovate taps bright future," Marietta Daily Journal). AJC photo of a MARTA train. However, the recruitment of large business headquarters operations to Atlanta and/or MARTA-adjacent locations, and the talk that Atlanta is out of consideration for landing Amazon's HQ2 because so much of the metropolitan area isn't served by heavy rail -- means that the counties with limited transit service are reconsidering the car-centric approach. Johns Creek Mayor Mike Bodker said the only sensible choice to handle congestion and avert high-density development “is one that does not involve the investment in light or heavy rail.” Bodker also was skeptical of the improved bus service. Newly elected Roswell Mayor Lori Henry said bus rapid transit would worsen congestion on Roswell Road, and a right-of-way for buses was nonexistent on Holcomb Bridge. The statements appear to be counter to our understandings about transit and the impact on congestion (when you have the right density and tight links between activity centers and residential areas). I mean, in a big city like Washington, I can "Idaho Stop" through major intersections at rush hour--because both the urban design of the city and the heavy rail anchored transit system captures a significant amount of the mobility demand--within the city 57% of people get to work by transit, walking, and biking. Interstate 75, Atlanta. Photographer unknown. 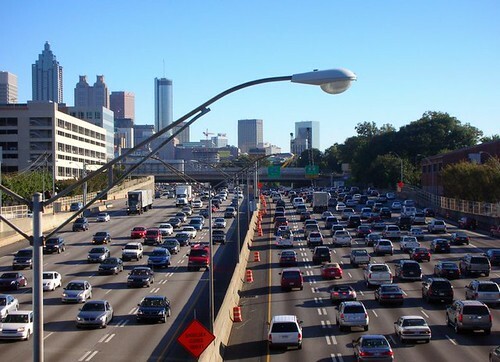 And certainly, the Atlanta method of having highways with as many as 24 lanes is not reducing congestion. (The Detroit area too is focused on freeway widening rather than sustainable mobility. See "MDOT: I-94 expansion will cost $3 billion through 2036," Crain's Detroit Business). Northern Virginia. I think Northern Virginia's heavy rail extension of the Silver Line is a particularly relevant example to both Detroit and Atlanta, although Detroit's situation is different as they have limited recent experience with rail transit, while Greater Atlanta has MARTA even if many counties are not served by it. It's really hard to lay the groundwork for moving to a transit centric or transit balanced mobility paradigm when your metropolitan area is car-centric. Even in areas with a great deal of experience with transit, such as the Washington area, development of new methods and modes such as streetcar and light rail, can be incredibly contentious. The Silver Line expansion. I am particularly proud of a piece I wrote about this in 2011, "Short term vs. long term thinking: transit, the Washington Examiner, Fairfax/Loudoun Counties vs. DC," because of its fundamental insight that the Silver Line heavy rail "extension to Dulles Airport" wasn't so much about providing airport access as it was repositioning and "reproducing" land use in the 21st Century around transit and more intensified land use (also see "Without the right planning "controls" you can't stop change: Loudoun County and rail service in Northern Virginia"). However, the difficulty of the applicability of the Silver Line example has to do with the fact that it is an example of polycentric transit system development in the arguments of Steve Belmont in Cities in Full--a five mile distance between many of the stations means that you don't get the same kind of intensification compared to places with a denser network of transit stations. But it becomes transit adjacent and way more "transit rich" than places without fixed rail transit systems. And the way that Fairfax County's office market is being reshaped, away from car-centric office parks to transit-adjacent locations is a demonstration of the change in preference for such locations ("Silver Line reshaping office market in Fairfax County"). The real question is: what should metropolitan mobility look like in the 21st century? Both Atlanta and Detroit need to work through that question. The space demands of automobility are significantly greater than sustainable modes. 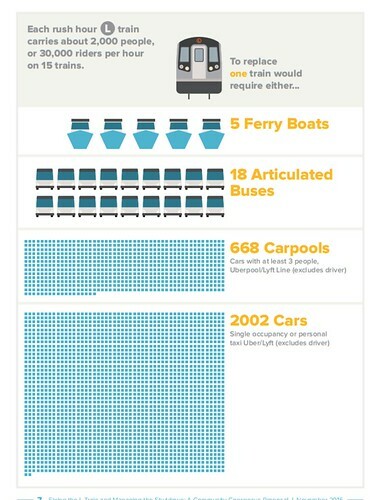 Mass transit moves significantly more people per lane of traffic. 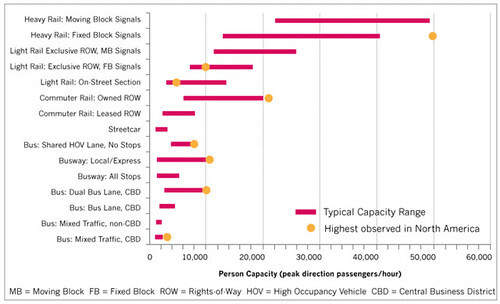 Maximum motor vehicle throughput on a freeway is 2,200 vehicles/hour. It's significantly less on arterials in suburbs and cities. Image from an Auckland transit planning process. 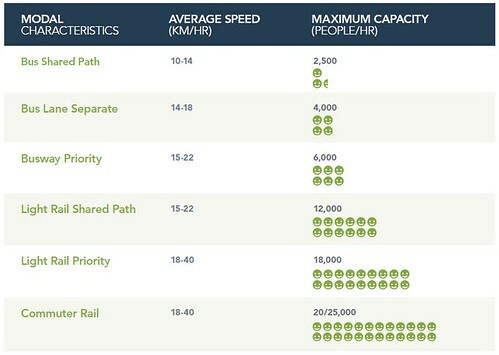 Person-capacity ranges for various transit modes. Despite all the talk about autonomous vehicles, etc., I think mass transit of various sorts, complemented by microtransit and other forms of sustainable mobility, makes the most sense in terms of moving lots of people. It won't work though if activity isn't concentrated. As far as autonomous vehicles are concerned, eventually they can make microtransit and what I call tertiary transit subnetworks--intra-neighborhood and intra-district transit based around transit station hubs--much more realizable by reducing labor costs. But people aren't thinking things through about autonomous vehicles and personal trips. Just because you need less space to park cars, because autonomous vehicles can be used throughout the day, doesn't mean that vehicle miles traveled is reduced, it may in fact, increase. So that means no substantive reduction in vehicle trips, in congestion, in road lanes required, etc. Note that while many major corporations are locating near transit in Greater Atlanta, the Atlanta Braves chose to relocate to a location in the Cumberland District of Cobb County, which has no substantive transit connections ("The Braves' New Ballpark Is An Urban Planner's Nightmare," Deadspin). Fresno touts new FAX Q brand of bus service. From the photos, it looks like the same kind of bus service offered elsewhere. This piece from WXYZ TV makes the point that Detroit was hurt in its bid for Amazon because of the dearth of transit infrastructure. This opinion piece in the LA Times, by a person affiliated with the LA Tenants Union, makes the point that transit is mostly used by the poor, and as neighborhoods "gentrify" transit loses its customer base, because the new residents aren't likely to use transit. Cincinnati transit agency woes. A group wants a transit sales tax. But one local legislator prefers to wait to create a super duper multi state master compact first.